Advice on what to do and how to safely dispose of any gauzes suspected of containing asbestos. The Health and Safety Executive has been made aware that two companies have supplied schools and potentially other users with gauze mats which contain asbestos. 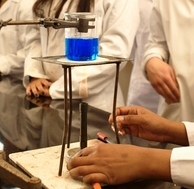 The metal gauze mats are designed for use over Bunsen burners. Our latest advice tells you what to do to safely dispose of any gauzes suspected of containing asbestos. Please also refer to the frequently asked questions on asbestos containing gauzes on our website for more details.